Agudath Israel of America’s hopes and prayers are with the residents of Houston and other Galveston Bay cities, who are struggling with the ongoing rain and terrible flooding brought by Hurricane Harvey. Our sympathies go out to all Texans who have suffered loss of life, and to those who have tragically lost their homes and possessions. And we have only admiration for all the emergency workers, both local and from other parts of the country, who are working around the clock to rescue those in danger. As we have done over the years when disaster strikes, Agudath Israel of America is serving as a conduit for sending humanitarian assistance like food, clothing and, in this case, Yomtov needs, to Jewish families and institutions in need. Donations for that purpose can be sent to Agudath Israel’s offices at 42 Broadway, 14th Floor, New York, NY 10004 (checks should be made out to Agudath Israel but marked “Disaster Relief Fund”). 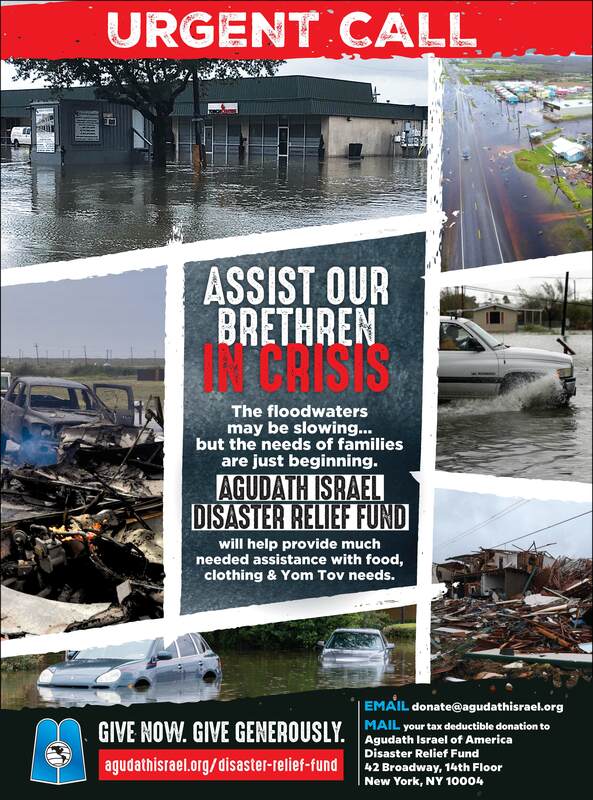 Electronic donations can be made at agudathisrael.org – with “Disaster Relief Fund” typed into in the “comments” box.